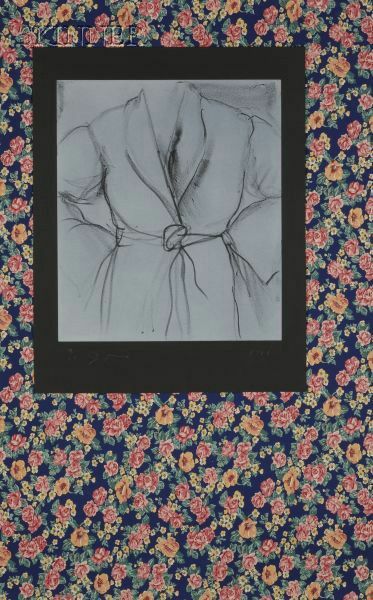 The Robe Goes to Town, 1983, edition of 59 (D'Oench & Fineberg, 144). 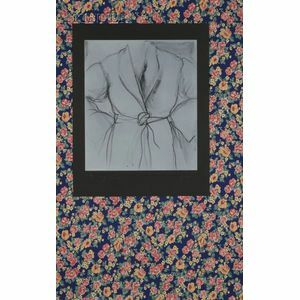 Numbered and signed "9/59 Jim Dine" in pencil l.l., dated "1983" in pencil l.r. Aquatint in white on black paper hinged to colored silkscreen, sheet size 57 x 36 in. (144.5 x 91.4 cm), unmatted, unframed. Condition: Top sheet unhinged from other sheet, nicks to edges of both sheets. The two sheets are no longer attached to each other. The nicks to the sheets are at the edges, but effect both sheets. There are minor handling marks (very hard to see) and creases to the larger, silkscreened sheet.